The Saturday Paper‘s Maxine Beneba Clarke interviewed Tommy while he was in Australia for The Other Film Festival in December 2014. 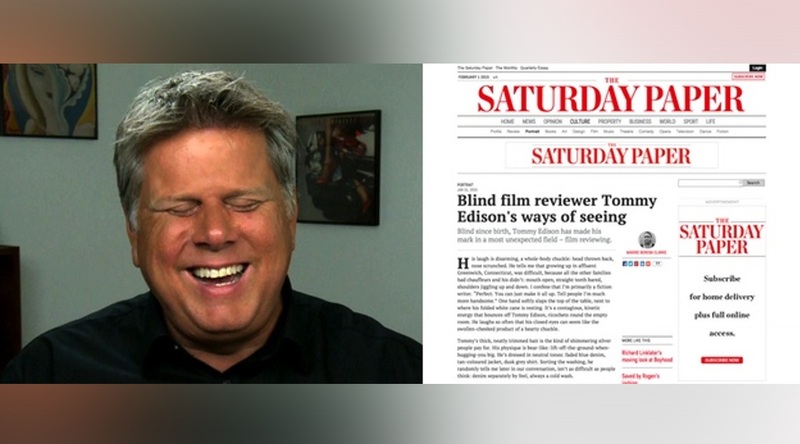 Blind since birth, Tommy Edison has made his mark in a most unexpected field – film reviewing. His laugh is disarming, a whole-body chuckle: head thrown back, nose scrunched. He tells me that growing up in affluent Greenwich, Connecticut, was difficult, because all the other families had chauffeurs and his didn’t: mouth open, straight teeth bared, shoulders jiggling up and down. I confess that I’m primarily a fiction writer. “Perfect. You can just make it all up. Tell people I’m much more handsome.” One hand softly slaps the top of the table, next to where his folded white cane is resting. It’s a contagious, kinetic energy that bounces off Tommy Edison, ricochets round the empty room. He laughs so often that his closed eyes can seem like the swollen-cheeked product of a hearty chuckle. Tommy’s thick, neatly trimmed hair is the kind of shimmering silver people pay for. His physique is bear-like: lift-off-the-ground-when-hugging-you big. He’s dressed in neutral tones: faded blue denim, tan-coloured jacket, dusk grey shirt. Sorting the washing, he randomly tells me later in our conversation, isn’t as difficult as people think: denim separately by feel, always a cold wash… CLICK HERE TO READ THE FULL ARTICLE.